Biotechnology with Enterprise allows us to harness and manipulate biological systems and materials for the benefits of areas such as medicine and commerce. Offered in partnership with the Leeds University Business School, this innovative degree at Leeds offers not only a comprehensive understanding of disciplines underpinning advances in biotechnology, but also covers the essentials of business, commerce and entrepreneurship. Our BSc Biological Sciences (Biotechnology with Enterprise) degree provides a comprehensive knowledge on the applications of biotechnology in the modern world, both commercially and clinically. The degree is designed for science students with a strong leaning towards business and commerce, providing a combination of technical knowledge in both business and biotechnology to give graduates strong career prospects. Biological Sciences (Biotechnology with Enterprise) is designed to produce graduates who meet employers' needs and are able to take full advantage of the rapidly changing and expanding arena of biotechnology and commerce. This degree offers you choice, time to decide upon a preferred subject area, and the opportunity to take “ownership” of your course. This course is developed in partnership with the Leeds Business School, one of the most respected and influential business schools in the UK. This course offers you the opportunity to undertake an industrial placement and study year abroad. This programme has been accredited by the Royal Society of Biology. 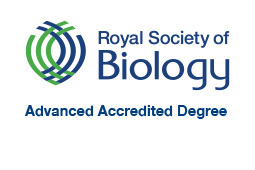 Advanced degree accreditation by the Society recognises academic excellence in the biosciences, and highlights degrees that educate the research and development leaders of the future. The advanced accreditation criteria require evidence that graduates from the programme meet defined sets of learning outcomes, including gaining a substantial period of research experience. In year one you will begin with the core themes of biotechnology alongside an introduction to strategic business planning and management. Themes including cell biology and genetics will be delivered together with a skills development module involving weekly tutorials and laboratory sessions. Year two will see you build on your skills and knowledge from year one, continuing to study biological processes at molecular and cellular levels. Business modules including ‘Entrepreneurship in Theory and Practice’ and ‘New Business Planning’ will complement modules in genetic engineering and human diseases to ensure that you develop a broad knowledge and skillset. Year three is your chance to integrate both your knowledge of Biotechnology and your understanding of commerce and enterprise, with a year-long project that is supported by tutors from the Business School as well as the Faculty of Biological Sciences. You will study advanced level topics that represent the cutting-edge of research within the area of biotechnology, and the skills you have developed throughout your previous years will continue to be honed to an even more advanced level. In year four you will study Masters level modules, as well as using your preparation from the previous years to undertake an extended research-project. Our degrees are delivered through a combination of lectures, tutorials and practicals, while you’ll also benefit from our range of online resources such as Virtual Labs @ Leeds. Including Biology and another science or science-related subject. Critical Thinking and General Studies excluded. We accept the following science subjects: biology, human biology, chemistry, mathematics, physics. Science-related subjects: PE, geography, use of mathematics, psychology, statistics, geology and computing. GCSE: Typically Grade 6 (B) or above at GCSE Maths and Grade 4 (C) or above at GCSE English. D3/D3/D3 including D3 Biology plus one other science or science-related subject. H1,H1,H2,H2,H2,H2 including H1 in Biology and another science at higher level. We accept the following science subjects: biology, human biology, chemistry, mathematics, physics. Science-related subjects: Science- related subjects: PE, geography, use of mathematics, psychology, statistics, geology and computing Scottish Higher: Scottish Highers not accepted on their own. AAA including Biology and another science or science-related subject. Critical Thinking and General Studies excluded. We accept the following science subjects: biology, human biology, chemistry, mathematics, physics. Science-related subjects: Science- related subjects: PE, geography, use of mathematics, psychology, statistics, geology and computing. IELTS 6.0 overall, with no less than 5.5 in any component.. For other English qualifications, read English language equivalent qualifications. With the expansion of the biosciences comes the generation of new and varied career opportunities. Some of our graduates go on to further study at Masters or PhD level. Other career routes include graduate medicine, dentistry, pharmaceutical and biotechnology industries, public health sector laboratories, university and government-funded institutes and health, medical, policymaking and government organisations. We have a dedicated Employability Officer in the Faculty of Biological Sciences who works closely with the University’s Careers Centre. We offer a host of additional opportunities beyond core course content, including volunteering and placements. We also organise regular careers workshops designed specifically for sport sciences students to develop their career opportunities. These include our annual Bioscience Networking Event, which gives you the chance to meet bioscience employers, speak to alumni, attend workshops and get masses of information. If you choose to undertake a study abroad option, you will spend the fourth year of the MBiol studying abroad. This will extend your studies by 12 months. Industrial placements are typically taken between your third and final year. This will extend your studies by 12 months. For your work placement in industry, staff at Leeds will help you with your CV and application letters and provide a list of organisations which may offer industrial placements.